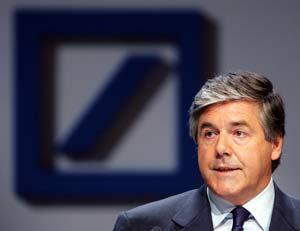 Deutsche Bank CEO Looks Forward To The Day When Women Make Exec Boards "Prettier" And "More colourful"
Well this explains why Deutsche Bank has no women on its executive committee. The firm’s CEO, Josef Ackermann, was speaking during the group’s annual press conference last week about how to ensure that women aren’t being blocked from the top positions in Deutsche. European officials just rejected a proposal to increase the number of women in boardrooms by requiring them to fill quotas, so the CEO was commenting on Deutsche’s next step. He said there are no women on the firm’s executive committee, BUT. “But I hope it will be prettier and more colourful one day” when more women are named. We’ll do our best, Mr. Ackermann, but some women look terrible in bright colours. He and his board had started a project “where we summarize always women specifically and in groups, training teach, coaching, they help to care for projects that they participate in leadership conferences, even if it may be of the positioning is not always so” he said in a press conference. So it’s “old school” to think women are like decorative flowers. This is way worse than Blankfein’s “God’s work” slip-up. The business publication Handelsblatt was the first to catch the statement.